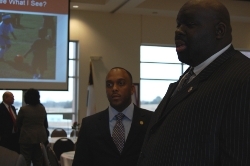 Lancaster ISD wants you to get connected! LISD increases communication in a variety of ways for parents and community members to stay informed. The Dallas Foundation has announced the opening of applications for the Deserving Student Scholarship for high school seniors. Staff, parents, and community members are invited to submit questions or recommendations regarding possible budget reductions for the 2011-2012 school year. The Dream Girls musical presented by the Lancaster ISD Fine Arts Department will be premiering in downtown Dallas at the Majestic Theater May 19. 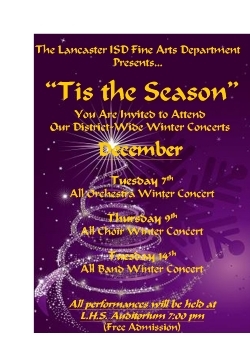 Mark Your Calendars for the District Wide Winter Concert! !